Dr. Guido Spadafora has practiced medicine since 1981 in the Ministry of Health of Panama. From 1979-1980 he supported Victoriano Lorenzo Brigade to fight against the dictatorship of Anastasio Somoza in Nicaragua. He fought for Panama's democracy since 1985 and he supported the Civil Crusade against the dictatorial regime of Manuel Antonio Noriega in Panama. He has denounced abuses and corruption in the media, written articles for the press and given interviews in the media. More recently, from 2013 to 2014, with the objective to clean up the National Assembly, he participated in the election campaign of current President of Panama Juan Carlos Varela as a candidate for the Alliance "El Pueblo Primero" with the Partidos Panameñista and the Partido Popular. Amb. Guindo Spadafora is not only a distinguished diplomat but also a gentleman that received us in the warm environment of his office. He introduced to us all the members of his team and was all the time open to talk and share with us his experience. Do you get along with German people? Definitely. I have been the Ambassador of Panama in Berlin for more than six months and, so far, it has been a wonderful experience. German people have been very supportive and I have a very good impression of the German diplomatic world. It is a very important country and I have found it very easy to do my work in this environment. After this first six months as an Ambassador, what would you say are your main objectives as a diplomat? Which aspects do you want to improve on the most? One of my first priorities is to improve the Panama's relation with the environment. The president of my country put the environmental issue on the table in his last campaign. So, following his path, I am working to bring German technologies to Panama in order to fight against the excess of pollution of my country. Water and forest contamination is increasing everyday, and our current most urgent task is to work against it in all the possible ways. In my case, I want to use the German knowledge to make Panamá an environmental-friendly country and a reference for other states with the same issue. How would you define the relations between Panama and Germany? The relations are excellent. Right now Panamá is celebrating the expansion of the Panamá Canal and it's a great moment for Panamá's international relations. 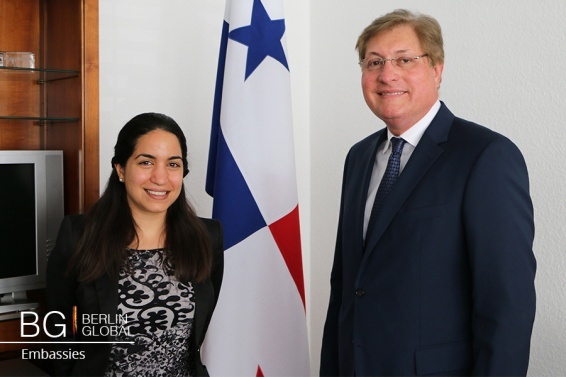 We work on motivating German companies to see Panamá with all its possibilities. Apart from this expansion, there are many other aspects of my country that have made Panamá a valuable benchmark for the Americas. Germany needs Panamá, and Panamá needs Germany, and we must work towards the strengthening of the relations between the two countries. Has Germany invested in the expansion of Panamá? Yes they have. For example, one of the excavators that we used for the expansion of the canal was from a German company. However, as I have said before, these investments should increase during the next years. And what about the relations between Panama and the United States of America? It is very good. Panamá is a multicultural country. From the very beginning of the construction of the Canal, many people from all around the world went there to work and Panamá became more and more open. For example, I was bon in Italy and later went to Panamá. It is the same situation for a lot of other Panama's citizens. Nowadays, people from everywhere are Panamanians and this makes my country a place full of diversity and at the same time, good at cultural understanding and cultural diversity. In this sense, the United States of America is not an exception and I believe we have a strong and healthy bilateral relationship with the country. And, do you believe that living in such a multicultural environment has influenced your own way of viewing culture? Culture defines us as a nation. Here we have several communities with different backgrounds and costumes. Even different regions in Panama's have different types of cuisine. That makes my country a place where acceptance and diversity play a very important role in society, and that has clearly influenced my view of seeing culture. Do you believe that cultural diplomacy can promote a better understanding between nations? Of course it can. What make our world beautiful are our cultural differences, and is the way we share them and how we accept these differences that defines us. What a boring world would it be without culture: all of us talking the same language, eating the same things... And, also, there are so many cultural diplomats! You do not even need to come from a government. Musicians, artists, even doctors that come to Berlin and share their work are promoting understanding between nations by sharing their culture. And that's it- travelling and discovering new cultures helps to create a bridge between nations. The problem is when culture separates nations. You worked as a doctor and specialized in dermatology for nearly 30 years. What made you change your field of work? Well, to be fare I never changed. During my whole live I was implicated with political movements and in my work as a Dermatologist, I also had to deal with people and use my communication skills with the patients. I believe we are not only one thing in this life, but many more. I am a Doctor but I am also a diplomat, because nowadays you have to be capable to fit in any kind of environment. My brother used to say that 'a smart man is the one you can throw in the jungle, and he will survive'. It seems that being an ambassador is quite challenging work. Which aspects of your position have you found the most demanding so far? I believe that one of the most demanding things is to make something happen. Because you can put objectives on a paper and you can write about the issues you want to change, but something really different is to actually do it. I think the most challenging part is when it comes to face reality, and when is time to fight for what you really want to change. What advice would you give to young people that are thinking about starting to work in the international field? I would tell them to have another profession, it does not matter which one. For example, Angela Merkel studied chemistry before. I believe it can prepare them to do a better job as diplomats.